Tonk is a pleasantly simple card game that is played for fun as often as its played for money. Best when restricted to only a handful of players, a game of tonk can be the perfect remedy to those who have grown bored with poker or spades. Deal five cards, clockwise, to each player. Face cards count for 10 points, aces for 1, and the rest are at face value. After all hands have been dealt, the next card is played face-up, in the center of the table, to start the discard pile. Remaining cards are placed next to the discard pile, to form the "stock." If any player has 49 or 50 points after the initial deal, that player "tonks," and wins the round. If two or more players have 49 or 50 points, the round is a draw. Deal again. Begin play, starting with the player to the dealer's left and proceeding clockwise. The objective of each player is to have as few points in his end as possible at the conclusion of play --after the first round, a hand of 49 or 50 no longer wins. Players can "drop" at the beginning of a turn--before drawing a card--by placing all of their cards on the table. If this hand proves to be the lowest point total of any player, that player wins that round. If players do not drop, they must instead draw a card off the top of either the discard pile or the stock. Place any spreads that you might have on the table. 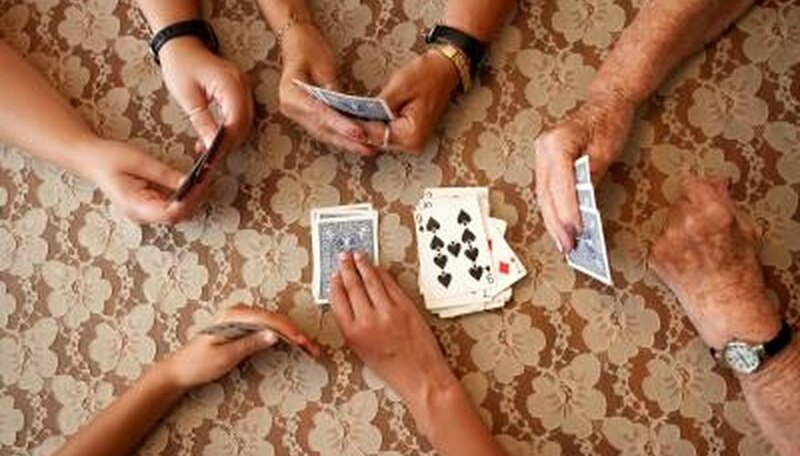 There are two types of spreads: The "book" is made up of three or more of the same rank (three 3s, three queens, etc), while the "run" is made up of three or more consecutive cards of the same suit (for example, the 2, 3 and 4 of clubs). You can also "hit" by extending a spread that has been previously laid--for example, a run of the 4, 5, and 6 of clubs can be extended by the 3 and 7 of clubs. At the end of a turn, players discard one of their remaining cards face-up onto the discard pile. Continue play until a player runs out of cards, either by playing spreads or discarding his final card at the end of the turn. Players can also still "drop" at any time, as in Step 2. In the event the stock runs out, the player with the lowest point total in her hand wins the round. Tonk can also be played for money, which is awarded to the winner at the end of each round. Players who play a 49 or 50 at the beginning, however, receive twice the usual stake.